We invite you to explore India - the Land with infinite beauty ! Whether you soar high into Himalayas or peer under the ruins of the Ancient monuments dotting the landscape of India, you will cherish the experience long after your visit ! This India Travel Guide on Basilica of Our Lady of the Rosary Bandel is free from any commercial interest! This site is dedicated to promote India - the vast subcontinent, its glorious past, magnificent landscape and its infinite variety. The Rosary is a Prayer of Hope - Symbolic of the Roman Catholic veneration of Mother Mary. It comprises of 5 sets of 10 "Hail Mary" interspersed with "Our Father" prayers. In the year 1214 AD, Saint Dominic was handed over the Rosary by an apparition of the Blessed Virgin Mary. This apparition is called as Our Lady of the Rosary - signifying 'garland of Roses'. Renowned as one of the oldest churches in West Bengal, the Bandel church stands as a memorial to the Portuguese settlements in Bengal. Dedicated to Nostra Senhora di Rozario, popularly known as Our Lady of the Rosary, this church was built in 1660. It was when the Portuguese began using Bandel as a port in the sixteenth century that they were given permission by the Mughal Emperor Akbar to build a town in Hooghly. It was around this time that the priests began to baptize the natives and soon the Catholics in Hooghly numbered around five thousand. The Augustinian Friars who were the largest religious body in Goa were enlisted by the Portuguese and soon the Emperor's permission was obtained to preach the Catholic faith to the public. The time was ripe to build a church at Bandel, in the year 1599. This first church of Bandel was burnt down by the Moors in 1632. As history reveals, Emperor Shah Jehan attacked and destroyed the Portuguese settlements including the church. Four out of the five priests were killed and lone Father Joan da Cruz survived. When Tiago, an ardent devotee of Mother Mary tried to carry her statue across the river to safety, he was killed by an enemy arrow. The statue sank into the river. When Father da Cruz was captured along with other devotees and condemned to die by stampede of wild elephants by the then Emperor Shah Jehan, a miracle occurred. The elephant stood in front of the priest and lifted him aloft with his trunk and placed him on his back. He also knelt before the Emperor with the priest on his back and asked for mercy. This miracle impressed the Emperor so much that he set the prisoners and Father Cruz free. It was after the miracle that Shah Jehan changed his mind and donated about 101.21 hectares to the local Christians, and a new church was constructed by Gomez de Soto in the year 1660 over the ruins. The keystone foundation of the ancient church remains in the eastern gate of this beautiful church. This church has several altars and a shrine of Mary, who is known as Our Lady of the Rosary and Our Lady of Happy Voyage. The church has a fascinating history. It was here that in the middle of the night that Father de Cruz heard a familiar voice of Tiago calling him from the waters of the river and announcing that 'Our lady was coming back'. The Father thought that it was just a dream and then Tiago announced in a miraculous light that 'She saved the Christians from death'. The next morning the statue of Mother Mary was brought by the local fisherfolk stating that 'Guru Maa' is back. As another story goes, when a captain of a vessel encountered a storm in the Bay of Bengal, Mother Mary rescued him. Hence, a ship's mast stands in front of the church. This was in fulfillment of his vow and gratitude for having survived the shipwreck. On the grounds of this basilica one can witness violet blossoms among the vintage tombstones. A spectacular life sized statue of Mother of Sorrows in marble sitting with the body of dead Jesus on her lap can bring tear to the eyes of the beholder. Every year during the month of November, an annual festival is held in this Basilica of Bandel. This is the time when thousands of pilgrims all over India congregate to thank Our Lady of Rosary and celebrate her miracles. The Bandel Basilica is located about 43 kilometres from Calcutta in West Bengal. It can be reached by air or rail. The Basilica is hardly about fifteen minutes from the Bandel railway station. 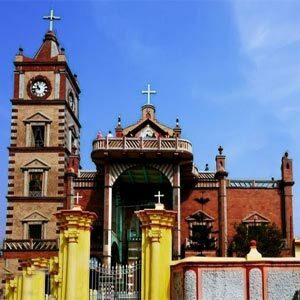 This Bandel church is a heritage church that was declared as a Basilica in 1988 by Pope John Paul II. 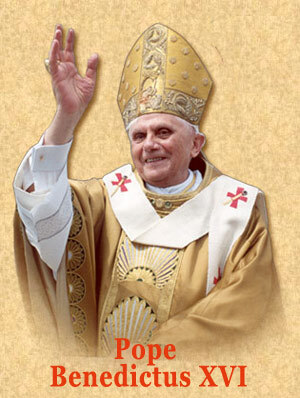 special favor which I earnestly request in my Rosary Novena: [mention yourrequest now]. Imay receive that which will be of greater benefit to my soul. prayer. Sweet Heart of Mary, be my salvation. "Prayer itself, born in Catholic families, nurtured by programs of Christian formation, strengthened by the grace of the sacraments, is the first means by which we come to know the Lord’s will for our lives. To the extent that we teach young people to pray, and to pray well, we will be cooperating with God’s call. Programs, plans and projects have their place; but the discernment of a vocation is above all the fruit of an intimate dialogue between the Lord and his disciples. Young people, if they know how to pray, can be trusted to know what to do with God’s call." The Rosary will be a very powerful armor against hell; it will destroy vice, deliver from sin and and dispel heresy. The Rosary will make virtue and good works flourish, and will obtain for souls the most abundant divine mercies. It will draw the hearts of men from the love of the world and its vanities and will lift them to the desire of eternal things. Those truly devoted to my Rosary, shall not die without the sacraments of the Church.